You’ve heard that relationships can impact your heart, but one man’s story proves it’s a legit, scientific thing. Koby Soto’s boyfriend of a month broke up with him on Saturday, which, naturally, sucked for him. 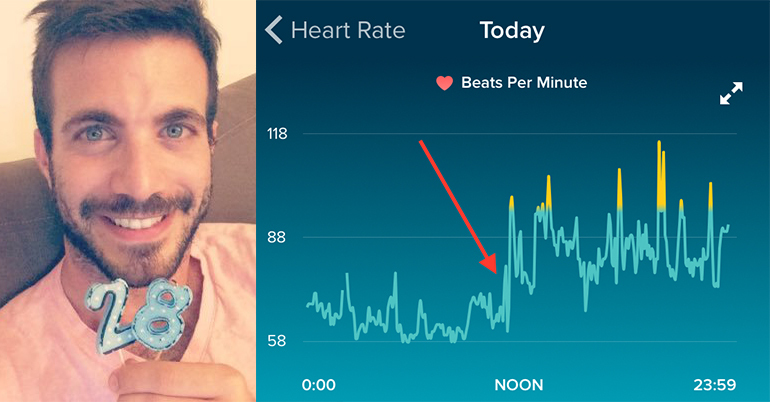 But when the 28-year-old checked his Fitbit later that day, he was surprised to see that his emotional reaction appeared in his health data. Koby’s heart rate went from a normal 58 to 70-some beats per minute range to a more erratic and all over the map 65 to 116 beats per minute during his breakup (which apparently went down around noon). “The first time I saw it, I was shocked, and thought it was a bit funny," Koby tells Mashable. "I didn't expect to be tracked." But, according to Koby’s Fitbit, the breakup legitimately helped him burn calories. “It thought I was working out, but I wasn’t doing anything,” he says. We are happy that you are ok now Koby. Let this year kick a new good start, keep smiling.